Rock climbing is booming right now, and why not. It’s great exercise, fun, and social. Here’s the beginner rock climbing gear you need to get started. Climbing is going up, in all directions. 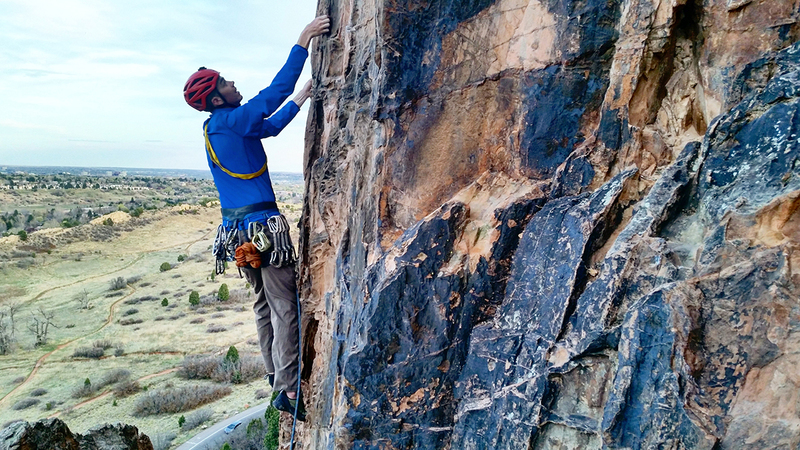 In the last five years, untold numbers of outdoors-people and urban folks have picked up the sport, with 40 climbing gyms opening across the U.S. last year alone and participation increasing indoors and at the crags. This article covers gear for top-roping and sport climbing routes for beginners tagging along with more experienced climbers. We spoke with John McDonough, Founder of First Ascent Mountain School and a climber with close to 20 years under his harness, for tips on the gear you need to get going. –This list does not include crucial safety or skills information; please seek professional instruction before heading outdoors to climb. Your tie-in point and primary on-person gear organizing area, a harness is among the first piece of equipment you will buy. More than a dozen major brands make harnesses, and they range in price from about $40 to more than $200. Fit is the most important aspect of a harness, and each brand has different sizing. If you fall between sizes from one company, try a different brand. 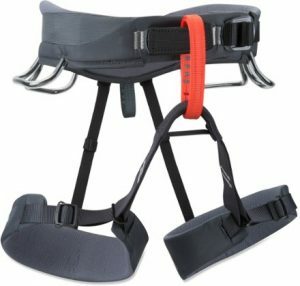 For beginner sport climbers, go with a more affordable harness. Get a basic model made for rock climbing. Purchase a harness with adjustable leg loops so you can use it in the winter and summer (harnesses with fixed leg loops don’t fit easily over winter pants). For top-roping, a simple harness is fine. Once you begin lead climbing, gear loops become important to rack quickdraws, cord, and extra carabiners. Falling rock is a real concern in the sport, as is hitting your head against the cliffside in a fall. Helmets are highly recommended (we consider them mandatory) equipment for anyone climbing outdoors. A helmet should fit comfortably and you should feel like you look good wearing it (so that you actually wear the helmet out there). A traditional *hard shell” (a.k.a. suspension helmet; pictured) will last longer and take abuse, but they are often less comfortable than the lighter weight foam-based styles. Safety testing of helmets includes the CE (European Committee for Standardization) and the UIAA (Union Internationale des Associations d’Alpinisme). Be sure your hard hat is certified. Tip: Some women’s-specific helmets offer a ponytail holder. Budget about $55 to $100 for a helmet. See a range of helmet options from REI here. Sticky rubber and a tight fit allow climbing shoes to step and find purchase on minuscule holds or jam into cracks. Spend the effort to find shoes that fit you right (and snug!) and you’ll gain an immediate boost in ability on the wall. Velcro closures, slip-on styles, and tie shoes are options. For beginner and intermediate climbers, we recommend lace-up shoes with a moderate or relaxed fit. They should be close fitting, but not overly painful. 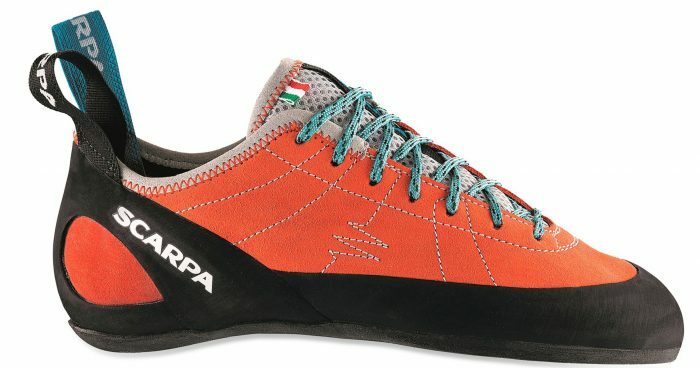 Aggressive shoes (see examples on REI here) are made for advanced climbers on advanced routes. Wait until you have more experience before stepping into aggressive shoes. Sizing is different between all of the brands, so try on a few pair. Attached to your harness with a locking carabiner, a belay device is used to control the rope. This includes while belaying a climber as well as for rappels off the top of the climb. There are many options and styles (see REI’s full spread) but all accomplish the same task of keeping the rope — and the climber connected to it — safe and in control. 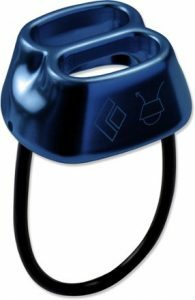 For your first belay device, many climbers choose a Black Diamond ATC. It is affordable at less than $20 and simple to use. Learn the technique of belaying with this “tube-style” device as a bedrock skill. Those belay skills will translate to using other devices, such as the popular Petzl GRIGRI, which gives assisted braking (but is not as easily used for rappelling). You’ll need a locking carabiner to attach your belay device. There are dozens of models available. Choose one with an easy-to-use locking mechanism and wide gate opening. 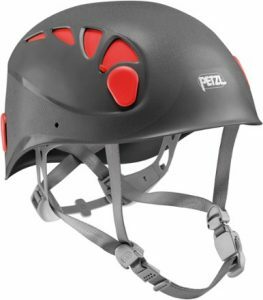 The Petzl Attache 3D Screw-Lock is a popular option. 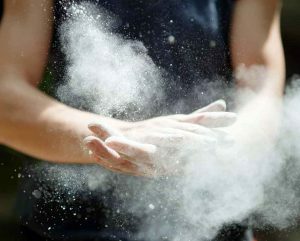 Chalk dries your hands to help keep them from slipping off the holds. Each climber is different; some don’t get sweaty hands or are accustomed to the climate or conditions, and other people are copious chalk users. There are many brands of chalk, some with big promises on superior grip. For beginner and intermediate climbers, any chalk type works; it’s a personal preference. Look at chalk regulations at each climbing area. Some locales only allow certain colors or don’t allow chalk at all, like Garden of the Gods or Arches National Park, which allow only red chalk. Get a chalk bag to hold your white dust. They come in all kinds of styles, from utilitarian $12 models to Rastafarian themes. For the beginner, these five items above provide a basic kit so you can hop in and start climbing with more experienced crag rats. Now, get your gear and head out. There’s a big world of vertical stone out there waiting to be climbed.